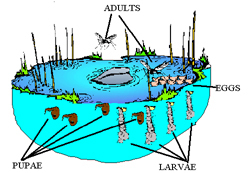 Mosquitoes go through a complete metamorphosis during their short life cycle. Juveniles look nothing like adults. The life cycle of a mosquito begins when the females lay their eggs on or near water. The immature stage begins when the eggs hatch into larvae. Most larvae have an air tube that penetrates the water surface allowing them to breathe. Larvae develop through four growth stages by molting then transform into pupae. (Pupae are the equivalent to the cocoons of butterflies.) Pupae last only a day before becoming adults. Once the adult is ready to emerge, they climb out of a slit in the pupae casing onto the water’s surface. At this point the adult is very soft. They must remain still until their bodies harden, at which time they are capable of flying. Once the adults are capable of flying, mating takes place and the life cycle begins again. Only female mosquitoes bite. The females need protein rich blood meals for egg development; however, both sexes will feed on flower nectar. In most species, the adult life expectancy is from three to four weeks.